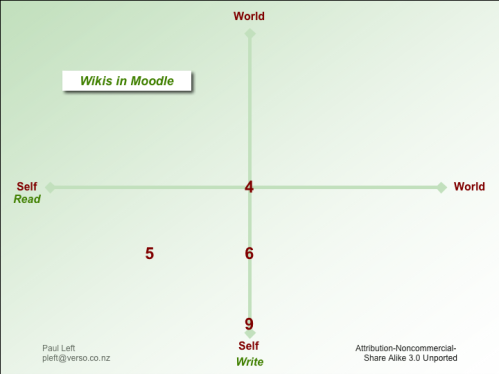 I’ve been asked how wikis in Moodle relate to the read-write matrix I published recently. There is significant correlation, because the standard wiki module installed with Moodle offers various settings to control who has read access and who has write access. When creating a new wiki, it’s best to check out the help file for the wiki type setting. This is a screenshot of the help file, with labels added for reference. 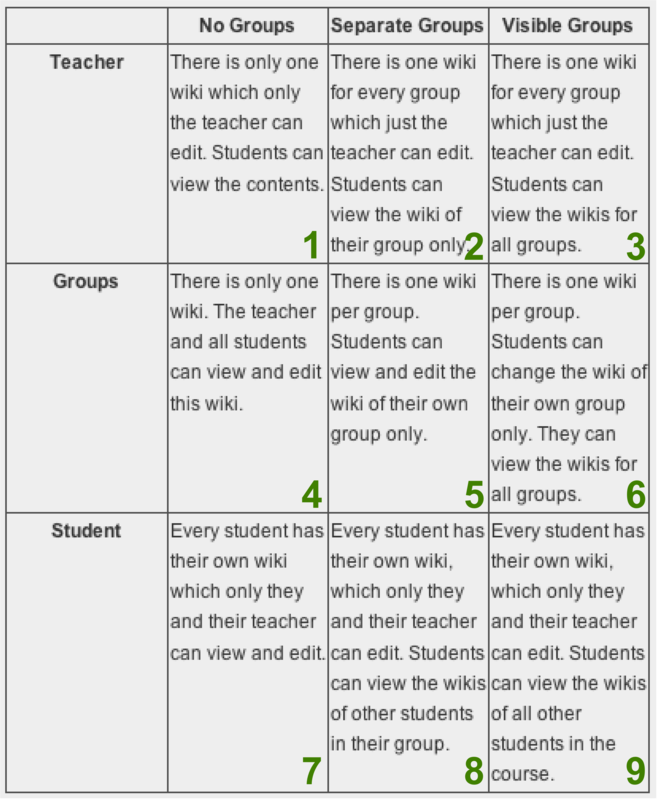 The matrix of 3 rows and 3 columns provides 9 options for who can read and who can write to the wiki. I’m not concerned here with the first row (options 1 to 3) since these are teacher wikis and cannot be edited by learners. Types 1 to 3 are useful for teachers to publish materials they don’t want learners to be able to edit: eg administrative information or course details. The types I find most useful for read-write learning are types 4 (for a fully collaborative class wiki) and type 9. But a class incorporating small group activities might use other types such as 5 and 6. While the Moodle wiki has quite a few limitations, the ability to control access and the ways that learners can collaborate can be very useful. But my advice is to plan the teaching and learning strategies carefully before setting up a wiki in Moodle – once the wiki is in use it’s not always easy to change the type! This entry was posted in Pedagogy, Tools and tagged collaborative learning, moodle, read-write matrix, wiki on April 30, 2008 by Paul Left.